The Hamilton East Public Library in Noblesville will hold a genealogy roundtable on Tuesday, September 9 from 2:15 to 3:15 pm in the library's genealogy classroom. The group will discuss the use of social media in genealogy research, including Facebook, blogs, message boards, and webinars. You are invited to bring your questions and share your own experiences. The Indiana Genealogical Society now has 1,338 databases in the Members Only area. Each of Indiana's 92 counties has at least 5 databases. The Indiana Genealogical Society's match challenge for the digitizing of War of 1812 pension files has now reached 15%. Thanks to all who have contributed so far! This match challenge seeks to raise $1,816 in donations (in honor of 1816, the year of Indiana statehood) - when we reach $1,816, IGS will match that with another $2,016 (in honor of the year of Indiana's bicentennial). Thanks to the participation of other organizations, that $3,832 will end up being $30,656 - enough to digitize some 60,000 pages of documents. The Hamilton East Public Library in Noblesville will hold a genealogy seminar on Saturday, September 13 from 9:30 am to 12:30 pm in the library's genealogy classroom. The seminar will focus on how to research brick wall ancestors - those whose paper trail seems non-existent. This seminar is free but registration is required. Register through the library's calendar of events on their website (www.hepl.lib.in.us) or contact the library's Indiana Room - phone (317) 770-3206. The Indiana Genealogical Society now has 1,337 databases in the Members Only area. Each of Indiana's 92 counties has at least 5 databases. The Northwest Indiana Genealogical Society will meet on Saturday, September 20 at 10 am at the Crown Point Public Library (122 N. Main St., Crown Point IN). There will be a "Networking for Researchers" session, where you can bring your brick wall research problems and others can try and solve it. The Indiana Genealogical Society now has 1,336 databases in the Members Only area. Each of Indiana's 92 counties has at least 5 databases. The Hobart First United Methodist Church and the Hobart Historical Society in Lake County are sponsoring a cemetery walk of City Cemetery in Hobart on Saturday, September 6 from 6 to 8 pm and Sunday, September 7 from 2 to 4 pm. There will be costumed actors and re-enactments. Tickets are $8 per person or $15 per couple. Participants should meet at the Hobart First United Methodist Church (654 E. 4th St., Hobart IN). For more information, please contact Megan Faulkner - phone (219) 742-1483. Registration is now open for the Indiana Genealogical Society's 2015 Conference on Saturday, April 25, 2015 on the campus of Indiana State University in Terre Haute. 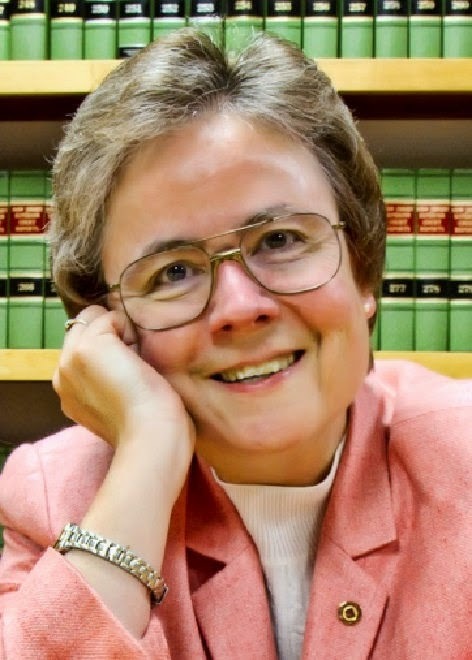 The featured speaker will be Judy G. Russell, JD, CG, CGL, of The Legal Genealogist. The local host will be the Wabash Valley Genealogy Society. Sessions will include courthouse research, DNA testing, Civil War pensions, Vigo County history and digital records of the Wabash Valley. Indiana Genealogical Society members will receive a $10 discount on conference registration. Indiana librarians: LEU credits have been applied for, and when they are approved, the information on the conference sessions will be updated. Register online, or download our printable registration form (PDF format). I am looking for the death date and location for Jehu A. Miller, born 19 Dec 1839, Blanchester, Ohio. His parents were Abraham and Belinda (Orr) Miller. He married my great-grandmother Ella N. Thomas on 1 Jan 1906 in Hamilton County, Indiana. Ella, her daughter Edna, and her son are on the 1910 Marion County census at 1141 W. 31st Street in Indianapolis. Jehu is not with them. Ella moved to Port Angeles, Washington, prior to the 1920 census. I could not find Jehu’s death information on Ancestry.com. Any help would be appreciated. Thank you. The Indiana Genealogical Society now has 1,334 databases in the Members Only area. Each of Indiana's 92 counties has at least 5 databases. The Brown County Genealogical Society will meet on Tuesday, September 9 at 6 pm at Saint David's Episcopal Church in Bean Blossom. 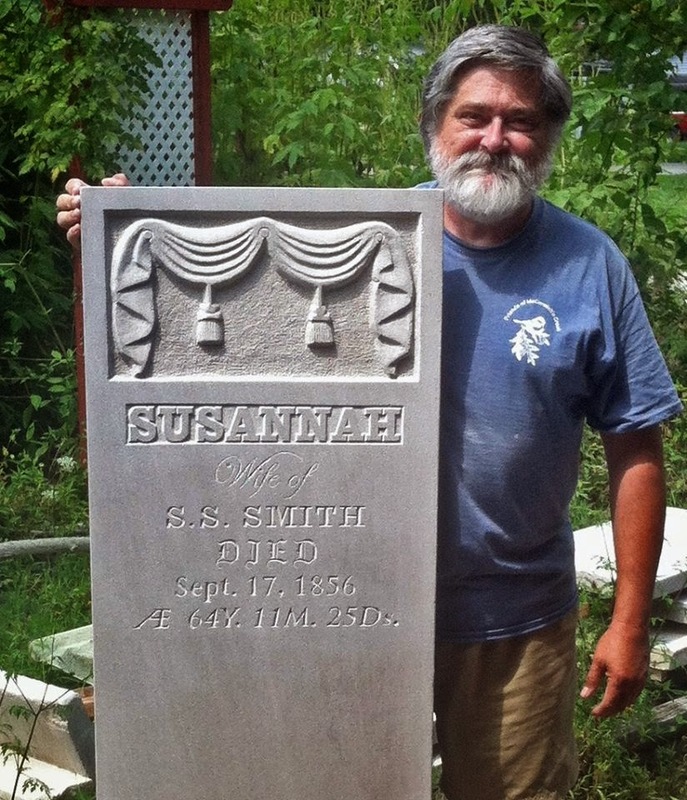 Casey Winningham will present a program about his work creating reproductions of historic headstones (see photo for an example), which uses the same hand-carved, hand-lettered process that they did back in the 1800's. He will also discuss how to preserve existing headstones. The Indiana Genealogical Society's match challenge for the digitizing of War of 1812 pension files has already reached 10%. Thanks to all who have contributed so far! This match challenge seeks to raise $1,816 in donations (in honor of 1816, the year of Indiana statehood) - when we reach $1,816, IGS will match that with another $2,016 (in honor of the year of Indiana's bicentennial). Thanks to the participation of other organizations, that $3,832 will end up being $30,656 - enough to digitize some 60,000 pages of documents. The Indiana Genealogical Society now has 1,333 databases in the Members Only area. Each of Indiana's 92 counties has at least 5 databases. He bought land in 1848, and I wonder if that was from a bounty from the war. Marietta died in 1860 of malaria and left him a widower with 5 children. John died in 1903 while on leave from the Indiana Soldiers and Sailors home and was buried in the Apostolic Cemetery in White County. He was honored in 1902, the year before he died and was asked to ride in the carriage with General Wilder, Colonel Thomson and Major Kilborn.. I would dearly love to see him recognized for his double service. His grave has a military headstone and a GAR star. I do not seem to be able to find where David is buried, as he should also have military recognition for serving so very young with his father. If you have any suggestions as to where I can do more research on them both, I would greatly appreciate it. Shelley Cardiel (cardiels@comcast.net) has found this photo of Amanda HUTSON STOUTENOUR which was taken at the Brittingham Studio. There is no location indicated on the photograph, though it is dated 1888. 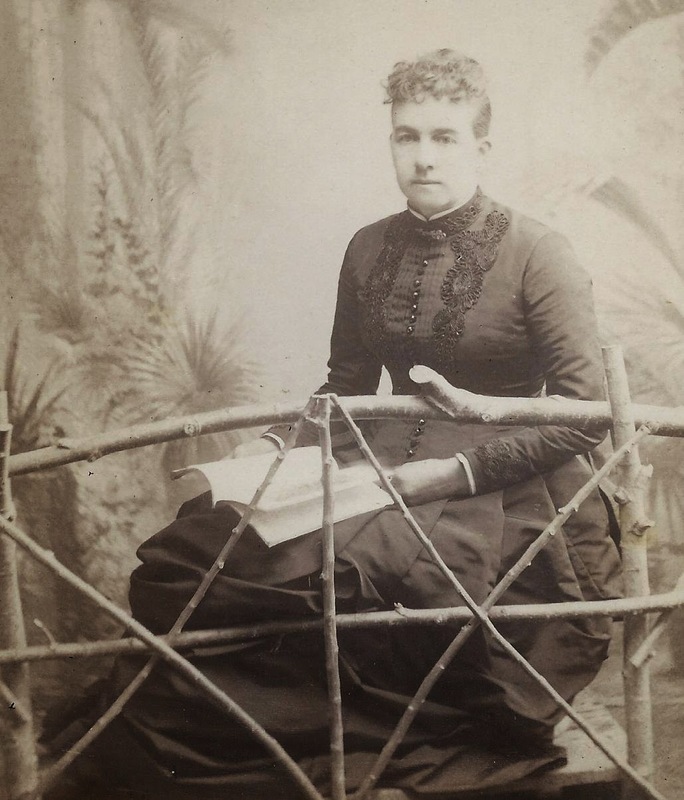 According to the limited research Shelley was able to do, Amanda HUTSON was born May 1841 in Ohio and married John STOUTENOUR (born 1840) in Elkhart County, Indiana on 19 October 1884. Shelley is hoping to locate someone from this Hutson/Stoutenour family so that the photo can be returned to the care of family. If you are a descendant of this family, or you know someone who might be, please contact her directly. The Southern Indiana Genealogical Society will meet on Thursday, September 4 at 7 pm in the Strassweg Auditorium of the New Albany-Floyd County Public Library (180 W. Spring St., New Albany, IN). Historian and author Gregg Seidl (pictured) will give a presentation, "The March from the Sea: The Civil War Diary of Robert Armstrong." Robert Armstrong was from Fredericksburg, Washington County, Indiana and served as a sergeant in the 66th Regiment, Indiana Infantry in the Civil War. He kept a diary during General William Tecumseh Sherman’s Carolina Campaign. Armstrong's diary gives an excellent account of the daily life of a Hoosier soldier in the United States Army during the Civil War. The Indiana Genealogical Society welcomes Mona Gehring as the Indiana County Genealogist for Elkhart County. She was appointed by the IGS board at their August meeting. Mona has been doing her own research for over 25 years, and researching for others for almost 20 years. She is active with the Elkhart County Genealogical Society and volunteered in the Sailor Library for 8 years. She has also written articles for the Elkhart County Genealogical Society's quarterly. If you have questions about Elkhart County research, please contact her at elkhartcountygenealogist@gmail.com. I’m looking for the Indiana marriage of my great-great grandfather Edward Mericle, ca.. 1845 – 1850. Edward was born c. 1826 in New York. On the 1850 census, he is shown in Manchester, Dearborn County, Indiana, at age 24, wife Rosetta 23 and daughter Sarah 1. On the 1860 census he’s in Iowa age 33, wife Luzetta 26, Sarah 11, George 8 and William 2. On 1870 census he’s in Iowa age 43, wife Luzette 42, Sarah J. 20, George W. 18, William 12, Ralph 8 and Ida 4. I’m assuming that Rosetta and Luzette are one in the same individual and that the age in 1860 is incorrect, but I would like to know what Indiana marriages show. Edward served in the Civil War from Iowa. From the time he arrived in Iowa, he lived in Appanoose County. He is buried near the former town of Iconium. 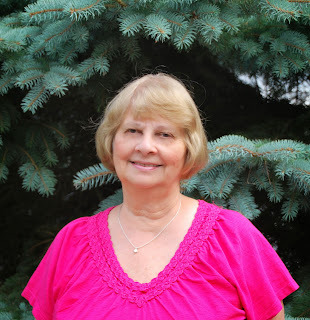 The Indiana Genealogical Society welcomes Kathy Sparr Mott as the Indiana County Genealogist for Dubois County. She was appointed by the IGS board at their August meeting. Kathy volunteers at the Jasper Public Library, answering patrons' genealogical questions. She also presents genealogy programs at the library. 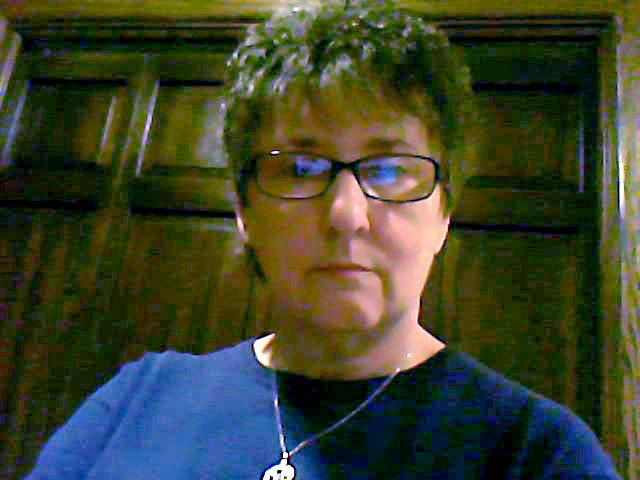 Kathy is a member of the Dubois County Genealogical Society, the Indiana Genealogical Society, the National Genealogical Society and the Indiana Historical Society. If you have questions about Dubois County research, please contact her at kmott@coopsone.com. The Genealogy Center of the Allen County Public Library in Fort Wayne will hold a free class, "Discovering Newspaper Databases," on Wednesday, September 10 from 3 to 4 pm in the library's Meeting Room A. Sara Allen will discuss the various newspaper database subscriptions available to library visitors, including Newspaper Archive and African American Historical Newspapers. This class is free and open to the public, as part of the library's "Digital Discoveries Series." To register, please call (260) 421-1225 or e-mail genealogy@acpl.info. The Indiana Genealogical Society now has 1,330 databases in the Members Only area. Each of Indiana's 92 counties has at least 5 databases. The Indiana State Library in Indianapolis will hold their annual Genealogy and Local History Fair on Saturday, October 25 from 9 am to 3:30 pm. Admission is free and open to the general public. This year’s theme is "Haunted and Historic Indiana." There will be more than 30 organizations and exhibitors will be in attendance - you can visit the tables in the "midway" to collect information from genealogical and local history organizations and Indiana public libraries, and shop the commercial vendors. There will also be presentations. Presenters will include writer and blogger Joy Neighbors, who will be giving two presentations: “A Grave Interest” focuses on the treasure trove of genealogical records than can be found in cemeteries; “Reading Symbols” discusses the various symbols and images on gravestones and their meaning. Ghost hunter Tim Poynter and local historian Al Hunter will be presenting the findings of their yearlong investigation of possible ghost sightings at the Indiana State Library. 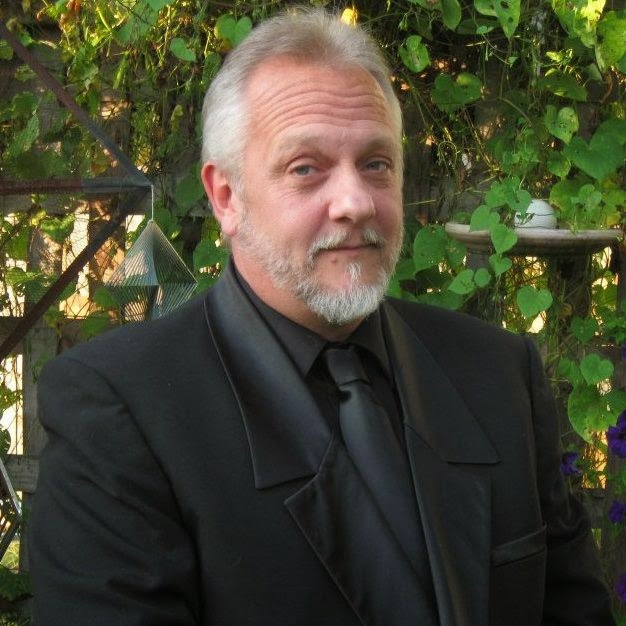 Steve Schmidt from the Indiana State Library will give a brief history of the library and surrounding property and introduce the ghost hunters. Parking will be available free of charge at a surface lot close to the state house. The address for the lot is 220 N. Capitol Avenue. The entrance to the parking lot is off of New York Street. If you would like to park closer to the library, there are a few metered parking spots. Complementary donuts, bagels, muffins, tea and coffee will be served in the morning (first come first serve) courtesy of CJ’s Sweets Creation and Catering. CJ’s will also have lunch items for purchase. At the end of the program, door prizes will be raffled off. There are now 960 Hendricks County probate records online. These files are free to the public and are part of our Records Preservation Project. The Indiana Genealogical Society now has 1,331 databases in the Members Only area. Each of Indiana's 92 counties has at least 5 databases. Even a $5 donation is enough to digitize 10 pages! The digitizing of the War of 1812 pension files is about 20% complete - there are already 188 files of Indiana veterans online, representing those whose surnames begin with the letters A through H. Because pension applications required proof of certain events, the pension files are often filled with original family documents, including Bible records. There are now 924 Hendricks County probate records online. These files are free to the public and are part of our Records Preservation Project. We are more than 95% finished with the unfolding and organizing of the probate records, which is the prelude to them being digitized. The Indiana Genealogical Society now has 1,329 databases in the Members Only area. Each of Indiana's 92 counties has at least 5 databases. I am looking for the parents and siblings and/or any other information available from Lake County, Indiana, records of a person named Albert B. Traeder, b 29 Nov 1849, Germany, d Aug 15 1884, Lemars, Iowa. He was married Jul 11 1876, in Cook County, Illinois. (those records are online) to Bertha Marie Woodke, b 7 Feb 1852, Prussia. He immigrated 1886 and d 13 Dec 1932, Odebolt, Sac County, Iowa. Bertha immigrated w/parents & siblings. She is the daughter of a Lake Co. settler/farmer John Woodke and Johanna/Hannah (nee Karl) Woodke. They had 8 children. She was child #3. All children, in order: William Frederick Woodke b1847, Henrietta Caroline b1849, Bertha Marie b1852, Otto William b1854, Charles John b1856, Herman Christian b1858, August Daniel b1861, Franz Frederick died as infant. There have been book bios written on members of the Woodke family, which is nice but I have found NOTHING on Albert B Traeder, husband of Bertha W. Of course there were other Albert Traeder's living at that time but none with the same birth year. I believe he must have lived in Lake County at some point in order to have met Bertha. If I hire someone to help and that person does not find anything, I'll probably have to hire someone to search Cook Co. records. I am searching for the parents or any information that I can find on my 2x-great grandfather. His name is Isaac Yost and I know that he was born in Indiana in 1826 or 1829. I think his middle initial is N. He later married a Nettie Hix in Iowa. It says on the census that he was born in Indiana. I do not know where in Indiana. He later moved to Santa Ana, California. If you have any information on siblings or parents, it would be greatly appreciated. Thank you. The Indiana Genealogical Society now has 1,328 databases in the Members Only area. Each of Indiana's 92 counties has at least 5 databases. Briefly, I am trying to find out if anyone is researching Edward Redman who emigrated with his family to Posey County, Indiana, in 1820. I have found out a great deal about his American descendants. If anyone is researching the English Redmans I have a lot I can offer them. I would love to be able to help because I have had so much help myself and am always grateful for the information I receive from fellow researchers. I look forward to your reply. Indianapolis-based Kassie Ritman has a blog, Maybe Someone Should Write That Down..., in which she talks about how to write down your family stories and the lessons she learned along the way from her Hoosier research. 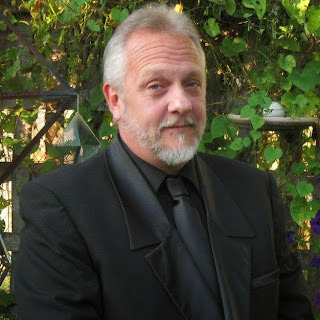 Ritman also writes a column for the International Society of Family History Writers and Editors' newsletter, titled "A Storied Past: Making Real People From Paper and Dust." The Indiana Genealogical Society now has 1,327 databases in the Members Only area. Each of Indiana's 92 counties has at least 5 databases. Trinity United Methodist Church and the Jasper County Historical Society are holding a dedication and celebration of a Methodist historical site on Sunday, August 24 at 1 pm Central at the Brushwood United Methodist Church. The historical marker will be placed at the Sandridge Cemetery, which is the burial place for The Rev. Helenor M. Alter Davisson (1823-1876) - when she was ordained in 1866 she was the first female to be ordained in any of the denominations that today comprise the United Methodist Church. The public is invited to attend the dedication at the cemetery and the celebration at the Brushwood United Methodist Church. The Rosebud School and the Jasper County Historical Society Museum will also be open from 11 am to 12:45 pm and 2 pm to 4:30 pm Central. The Indiana Genealogical Society now has 1,326 databases in the Members Only area. Each of Indiana's 92 counties has at least 5 databases. I was instructed to ask for your assistance in seeing if anyone is gathering genealogy information on the Baughman family from Terre Haute and other parts of Indiana. I am looking for my husband’s father's side of the family. His grandfather, Maxwell Baughman, born 4 Sept 1910, Sullivan, Indiana. Maxwell married Opal Patrow 7 May 1941. Maxwell died in 1951. Opal Baughman died a few years later, January 1955. Maxwell's father was Thomas Baughman and mother was Elvie (or Elva) Brummett. Robert Archer, died 1 Apr 1816, Gibson County. He was a Revolutionary soldier; born in South Carolina. William Archer, married 16 Jan 1812, Knox County. Died 24 Feb 1842 or 1843, Gibson County. He was born in South Carolina. Nancy Caroline Archer/Dilday/Reed, died 11 Feb 1905, Boonville, Gibson County. Nancy was born and married and died in Gibson County, Indiana. The Indiana Genealogical Society now has 1,324 databases in the Members Only area. Each of Indiana's 92 counties has at least 5 databases. The Indiana Genealogical Society now has 1,323 databases in the Members Only area. Each of Indiana's 92 counties has at least 5 databases. Mark Davis, owner of Stone Saver Restoration, will lead a hands-on cemetery restoration workshop on Saturday, September 13 from 8 am to 4 pm at the Historic Estates of Serenity Cemetery in Marion, Indiana (located at 1101 S. Lincoln Blvd., formerly the I.O.O.F. Cemetery). There is a $30 fee to attend, which covers all the materials, and also includes lunch. Participants must first attend an instructional session on Friday, September 12 at 6 pm at Marion Public Library. To register, or for more information, please contact the Marion Public Library - phone (765) 668-2900. This workshop is part of a Cemetery Education & Restoration Series, which was made possible by a Historic Preservation Education Grant from Indiana Landmarks, Indiana Humanities and the National Endowment for the Humanities. The Indiana Genealogical Society requests the services of 2-3 members in the Indianapolis area to help staff a publicity table at the Indiana State Library’s Genealogy Fair on Saturday, Oct 25. Duties would include distributing flyers and telling interested attendees about IGS and the services available to genealogists and./or members. Morning, afternoon, and all-day shifts are available. Volunteers may attend the workshop sessions during their shifts. For information and/or to volunteer, contact IGS Corresponding Secretary Ron Darrah at rdarrah@att.net or (317) 594-9786. The Society appreciates your assistance. The Genealogical Society of Marion County will hold their annual conference on Saturday, October 11 from 9 am to 4 pm at the Indiana History Center in Indianapolis. Lou Szucs and Julianna Szucs Smith of Ancestry.com will be the featured speakers, and sessions will include immigration records and naturalization records. Indiana librarians can receive 6 LEU credits. Registration (which includes lunch) is $32 for GSMC and IHS members, $40 for non-members. For more information or to register, visit http://www.genealogyindy.org/cpage.php?pt=104. The Mishawaka Public Library (209 Lincolnway E., Mishawaka IN) in St. Joseph County will hold a genealogy roundtable on Thursday, August 28 at 6:30 pm. Beginners and experienced researchers are welcome to chat about their family history and research. For more information, contact Deanna Juday. The Elkhart County Genealogical Society will host a program by Jeannie Regan-Dinius, Director of Special Initiatives for the Indiana Department of Natural Resources' Division of Historic Preservation and Archaeology, on Thursday, August 21 at 7 pm. The program will be held at the Elkhart County Historical Museum (304 W. Vistula St., Bristol IN). Regan-Dinius will discuss cemetery preservation, as well as what cemeteries can teach us about our ancestors and the past. The Indiana History Center in Indianapolis will host a genealogy workshop, "How Hoosiers Got Hitched," on Saturday, November 22 from 10 am to noon. Harold Henderson, CG will discuss how Indiana marriage records have changed over the years, focusing on the 1880-1930 time period when some counties created more than one record type for each marriage. Registration is $8 for IHS members, $10 for non-members. Indiana librarians can receive 2 general LEU credits for attending. Register online, or call (317) 232-1882. The Indiana African American Genealogy Group will hold a Genealogy and History Conference on Saturday, October 18 at the Eiteljorg Museum in Indianapolis (500 W. Washington St.). Melvin J. Collier will be the featured speaker, focusing on methodologies to trace African-American ancestors before the 1870 census, when many were living in slavery in the South. Registration is $25 for IAAGG members, $35 for non-members. Registration is available online through their website. The Hamilton East Public Library in Noblesville will hold a free workshop on free websites for genealogy research on Wednesday, August 27 from 9:30 am to noon in the library's computer training lab. You'll learn how to use Cyndi's List, Find A Grave, FamilySearch, Rootsweb, USGenWeb Project and Google. This is a hands-on workshop - after the demonstrations, participants will be able to research their own ancestors. The Wabash County Genealogical Society will meet on Monday, August 18 at 6 pm at the Winchester Senior Center (239 Bond St., Wabash IN). Ron Darrah will give a presentation, "Populating Hoosierland," about the various ethnic and religious groups that settled the state of Indiana. The meeting is free and open to the public. The Indiana Genealogical Society now has 1,321 databases in the Members Only area. Each of Indiana's 92 counties has at least 5 databases. “A few weeks ago, some friends of mine, who live at 6110 South Franklin Road in Franklin Township, Marion County, were digging in their backyard when they struck something hard. They decided to dig it up to see what it is and it turned out to be the top half of a headstone. The person's name was Claumer Bosse and he/she was born in 1805 and died in 1871. They contacted us at the Franklin Township Historical Society, and we now have possession of the headstone at our meeting house. As a member of the Society, I know that the “Bosse” last name is not known to the township, but just to make sure, we checked our “Called Home” book and didn’t find this person listed there. In addition, we have no record of a cemetery ever being on this property. I also checked Find-A- Grave and couldn’t find anything there, either. Then I contacted the Indiana State Library to have them check their records, and they couldn’t find any record of this person, either, so they referred me to you. We think this headstone may have been the victim of vandals. The Carmel Clay Historical Society in Hamilton County will meet on Wednesday, August 27 at 6:30 pm in the program room of the Carmel Clay Public Library (55 4th Ave. SE, Carmel IN). Virginia Terpening, former director of the Indiana Medical History Museum, and James Dillon, MD will present a program about the common diseases and causes of death for ancestors in the 1800's (including ague, brain fever, dropsy, and spotted fever). The Indiana Genealogical Society now has 1,320 databases in the Members Only area. Each of Indiana's 92 counties has at least 5 databases. I am attempting to link Peter Stainbrook/Steinbrook to his daughter Catherine Stainbrook who married James Fram 27 Aug 1840 in Muskingum Co., OH. Peter was originally from Brush Creek, Muskingum Co., OH. Marriage Peter Stainbrook & Mary Wiley - Nov. 25, 1819, Muskingum Co., OH. Peter & Mary Stainbrook - 1850 Census in Pidgeon, Vanderburgh Co., IN. Peter & Mary Stainbrook - 1860 Census in Knight, Vanderburgh Co., IN. Peter Stainbrook - 1870 Census in Knight, Vanderburgh Co., In. 1855 Grantor Peter Stainbrook Grantee - Wm. Fletcher in Muskingum Co., OH. (document was revised in 1872) I'm thinking Peter Stainbrook probably died around 1872. I am looking for an obituary or probate record in the vicinity of 1872. This information is to be used for a DAR application. Thank you. Can you recommend anyone who (for a fee, of course) could get me copies of some Indiana Vital Records, please. I'm specifically trying to get the marriage of George Jeffers and Annabelle O'Bannion in Marion County on 2nd July 1904 and the birth of their daughter Leona May Jeffers, which I think was on 6th Sept 1906, also in Marion County - but I'm not 100% sure on this. I hope you can suggest someone, please - it's difficult to do American research in person from the other side of the Pond. Thanks. The Indiana Genealogical Society now has 1,319 databases in the Members Only area. Each of Indiana's 92 counties has at least 5 databases. The Hamilton East Public Library in Noblesville will hold a free workshop, "An Eight Step Approach to Genealogy," on Saturday, August 16 from 9:30 am to 12:30 pm in the library's genealogy classroom. You'll learn the very basics of getting started in your family history research, including genealogy research methods, and you'll also see what's new in genealogy resources. This class is ideal for beginners, as well as more experienced researchers who are returning to genealogy after a break. The Indiana Genealogical Society now has 1,315 databases in the Members Only area. Each of Indiana's 92 counties has at least 5 databases.